Do You Want To Slow Your Parkinson’s Down? 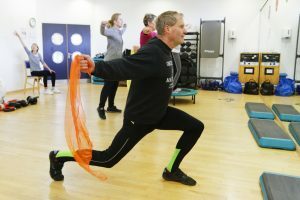 PD Power is based on an Australian ‘neuro-active’ exercise philosophy called PD Warrior™ which was started in 2011 by 2 neurophysiotherapists, Melissa McConaghy and Lynn Tullock, specifically for people with Parkinson’s Disease. We know that medication helps with symptom relief and general exercise programs keep you healthy, but neither of them slow the progression of your disease. Recent evidence suggests that the right kind of exercise can help modify the path of Parkinson’s and slow it down and that exercise should be looked at as a daily dose as with medicine. It is based on 7 core principles : meaningful, complex, powerful, frequency, high effort, specificity and FUN! What type of Exercise is PDPower? Although PDPower is based on an exercise philosophy it not a general exercise program to keep you fit. It is not an exercise program you can dip in and out of once a week. It is a chance to modify the path of Parkinson’s by changing your way of thinking, the way you move and the effort you need to move. This combination will drive changes in your brain called neuroplasticity but only if you commit to working hard daily. An initial assessment is essential because one size does not fit all and, therefore, treatment and home exercises will be based on each individual’s needs. The initial one to one sessions will allow you to both understand the philosophy and practise it prior to attending the classes, meaning you will get more out of the classes. The classes are a weekly time to touch base to check you are performing to the best of your ability and will allow me to progress you accordingly; all exercises should be challenging!! Once you have fully learned the philosophy, you can get on and do it yourself at home. The exercises are High Effort (80% of perceived effort), large amplitude movements with few repetitions. A degree of fitness will be beneficial to you. Once basic exercises have been mastered, we begin dual tasking activities to continue to challenge you and drive neuroactivity in the brain. 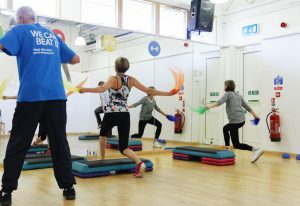 Exercises can be delivered on an individual basis with your physio or via classes. DAILY home exercises (about 5-10 minutes only) are essential for your daily dose! Don’t worry if none of this makes sense at the moment, I will go through everything with you thoroughly at your assessment. If you would like to find out more about PD Warrior please visit their website.